The perfect symbol of patriotism and support of Great Britain's team at this year's Rio Olympics. Our team of florists have chosen the very best red,white, and blue chrysanthemums to make up this fantastic floral display. 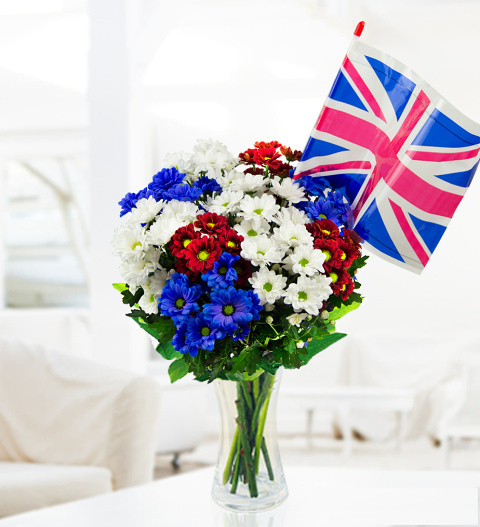 Arranged in colourful clusters as a floral representation of the Union Jack and we have also included a flag for you to wave with pride. Send this bouquet to a loved one of family of somebody competing in the Olympics or treat yourself and show everyone who you're backing! This bouquet is also available for UK next day delivery. Chocolates may contain nuts.